GrayMatter announced the selection of its Car Park Revenue Management (CPRM) solution by Swedavia AB, a notable addition to its portfolio of marquee clients. The solution is intended to provide automated system that recommends optimal pricing for airport car parks as well as to provision reports for monitoring and decision-making. The engagement shall cover the car parks of both Stockholm Arlanda Airport and Göteborg Landvetter Airport. Stockholm Arlanda Airport has approx.16 000 spaces across 15 car parks while Göteborg Landvetter Airport has approx. 9000 spaces across 7 car parks. Ms. Eva-Lena Söderberg, Manager B2C Product & Pricing, Parking and Entry, Swedavia AB stated “We are excited with the promise of an automated system that would enable smarter pricing and stronger decision support. I have used similar revenue management systems for hotels and looking forward to seeing GrayMatter’s CPRM in action for our airports”. Ms. Vita Andrews, Head of Parking, Parking & Entry, Swedavia AB, stated “I am glad that we have embarked on this engagement with GrayMatter. I am expecting that the CPRM system would enable much more accurate pricing in response to dynamic changes in factors affecting car park occupancy”. Mr. Vikas Gupta, CEO, GrayMatter said “We are glad to associate with Swedavia for this engagement. We are positive that the CPRM system shall deliver significant business value to Swedavia“. 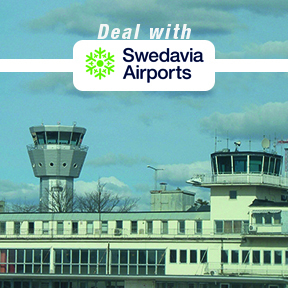 Swedavia owns, operates and develops Sweden’s national basic infrastructure of airports. These ten airports form a system that connects Sweden together as well as connects Sweden with the rest of the world. The company was formed in 2010 and is wholly owned by the Swedish State. Together with its partners, Swedavia creates added value for its customers by offering attractive airports and access that provide smooth and inspiring travel experiences. Swedavia’s aim is for our airports to be the most important meeting places in Scandinavia, along with being an international role model in sustainability and a growth engine for all of Sweden. predictions. CPRM also consists of reports, dashboards and visualizations that enable decision support for car par decision makers.